Pick a Place! Any Place! Since your store can be ANYTHING, the first thing you will need to determine is what kind of store you want. 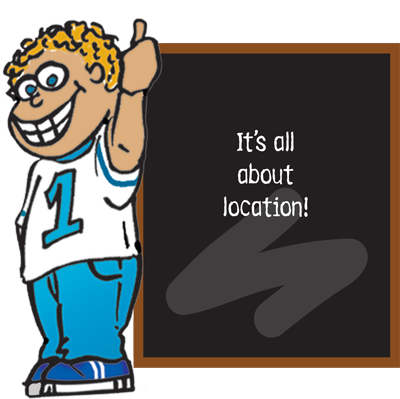 Survey your school...keep in mind the following when selecting a location. If you want a mobile cart, you will need to purchase a rolling cart and find a home for it when your school store is closed. If you will be at the same place every morning, consider a table in the cafeteria. You can store supplies in a plastic tub and simply put them out every morning. If your school has a room or space that can be dedicated exclusively to the store, then decide how you want to arrange the area. Since stores are often open before school, after school, or during lunch when kids have limited time, pick a place that is convenient and highly trafficked. If your options are limited, you can always use marketing efforts (see page 13) to divert traffic to your area. If you are using a cart, remember that your location does not have to be static. REAL TIP: Some elementary schools with lower capacity only allow one grade per day to visit the store-i.e. Kindergarten comes on Monday, First Grade on Tuesday, etc. If you go this route and are using a cart, you can move the store to that grade’s area each morning. If you are using a mobile cart, a sufficient location will be needed for storing the store during off-hours. For school stores occupying a dedicated space, don’t forget about the storage of your excess inventory. You will most likely have to confer with your principal and look closely at your school’s schedule. Most stores are open before school, during lunch hours, or after school. Some school stores are open every day, or as little as once a week. Pick what works best for you and for the school. Since no man is an island, a lot of School Store Managers opt to have help in running their store. While not necessary (we’ve heard lots of stories about very successful one-person operations), the support can be a great asset. And, as we’ve already mentioned, the store can be a great way to get your school behind a worthy project! The first decision to make is whether or not you want to involve students. The school store can be a great learning tool, particularly with older students, and their help can prove to be invaluable. If you want students to work in your store, you need to start scouting for qualified applicants. Ask teachers for recommendations and then have students fill out an application (staffing). Does your school have a student council? This is a great student council fund-raiser! If you are not going to have students working in your store, you may want to seek a partner or partners to help out. Some stores, particularly those run by PTA’s, rely on several volunteers to man the store during open hours while one person assumes responsibility for ordering, inventory, etc. You need inventory to start a store, and Geddes is the answer! You can request a FREE Catalog from us. This is a handy resource to keep around your school store. While you may want to order conservatively on your first purchase, consider the size of your school as you select each item. Smaller schools will obviously go through less merchandise while larger schools will need more. While you don’t want to run out of anything, you also don’t want to be overstocked for too long with the same stuff. We are constantly introducing new items, and the fresher your assortment, the more often kids will come to shop. Real Tip: Put together a committee of students to go through the catalog with you. Input from the people who are going to be buying these items is invaluable! Restrictions–Has your principal told you absolutely no toys? Be sure to keep such things in mind as you select your first assortment of items. Also consider your grade levels. If you are elementary, check out our fun assortment of exciting pencils. Middle schools may want to go heavier into pens and mechanical pencils. 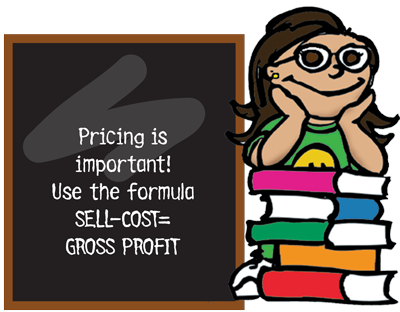 Pricing is an important factor, not only in selecting items for your store but also in creating a store that is profitable for you and affordable for your students. When setting prices, be sure to consider whether or not your students can afford the merchandise at the price you set. We’re always amazed by the number of people who say, “I don’t know,” when we ask if their school has a school store. EVERYONE should know! Parents, students, and teachers should ALL be notified. Tell everyone the why's, what's and where's of your school store. You Are Open For Business! Consider adding some fan fair to the launch of your school store with a ribbon-cutting or grand opening celebration!